The Moorhen Model Boat Club is based at the Roydon Village Marina, Roydon, CM19-5EJ, where club members have use of the marina facilities including the cafeteria, where there is always a smiling face to greet us. We meet on the second Wednesday of every second month starting in January at the British Legion, Radburn Pavilion, Latton Common Road, Harlow, Essex. CM18-7EG. We are a relatively small club established in 1979, but new members are always welcome to come and join us. We hold regattas Sundays between March and November, these dates can be accessed from the calendar button on the navigation bar above. 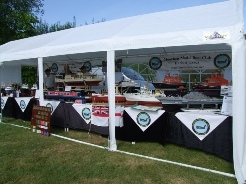 The club also attends a number of shows and exhibitions around the country, including the London Model Engineering Exhibition at Alexandra Palace, Wings N Wheels Spectacular at North Weald Airfield, Essex and the International Model Boat Show, at the Warwickshie Exhibition Centre. where we get to display our boats, and get to meet other clubs and the public, as well as raise funds for good causes. We hold various social events including greyhound racing, ten pin bowling and just for fun a quiz night in December, where the winning team get a bottle of wine and a wooden spoon for the losers, of which some teams have a good collection. Our club is very active and friendly, so why not come and visit us at Roydon Village Marina. Further details can be obtained from our club Secretary, Alan Argent on Tel: 01945 870919,, the Social Secretary Andrew Hodsden on Tel: 01279 419339.you can also visit us on facebook. The Membership Year begins on January 1st and Application Forms can be downloaded from our 'Information' Page. Please note: new items listed in the classified section. The club was established in 1979 and currently has 34 members. The Moorhen Marina is owned by The Canals and Rivers Trust and the club leases an area of water from them. Only club members are allowed to sail their model boats at the Marina, as The Canals and Rivers Trust require insurance which is provided by the club. We meet on the second Wednesday of each month at the British Legion, Radburn Pavilion, Latton Common Road,Harlow, Essex. CM18 7EG. The club holds regattas on designated Sundays and Wednesdays from March to September and trophies are presented for the competitions at the prize giving dinner which is held in November each year.